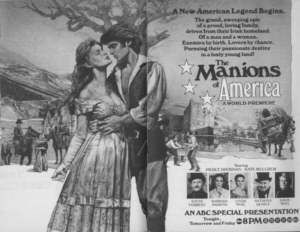 The lavish mini-series The Manions of America (9 PM ABC) opens its three-night run tonight and, like many of its predecessors, it mines drama from history: in this case the plight of 19th century Irish who fled British rule - and a devastating famine - to seek their fortunes in the United States. Featuring a richly textured script (by Upstairs, Downstairs contributor Rosemary Anne Sisson) and evocative location filming (in Ireland), Manions also offers some fine acting from Kate Mulgrew, Linda Purl, David Soul and TV newcomer Pierce Brosnan - who, in the leading role, is reminiscent of James Dean. Debut: Adventure, romance and political intrigue fuel this three-part drama. It opens in Ireland in 1845, when the Great Potato Famine starved millions, forced thousands to immigrate to the U.S., and intensified the efforts of others to seek independence from Great Britain, which then governed the whole country. Among the later group is fiery Rory O'Manion (Pierce Brosnan), a dirt-poor tenant farmer sowing the seeds of rebellion in rural County Galway. In Part 1, though, complications ensue for Rory from his love for Rachel Clement (Kate Mulgrew), a landed British aristocrat and a haughty firebrand in her own right. 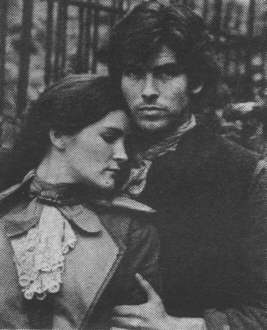 Their stormy affair, played out in Irish-filmed locales, lays the groundwork for a tale of pride and prejudice and hope and tragedy that carries over into America, where the story continues tomorrow and concludes on Friday at this time.